The HP Alumni Gala Dinner is now less than 2 months away! We hope you would not miss this excellent opportunity to catch up with your buddies, friends and develop new friendships and partnerships at our annual event. And not forgetting networking opportunities! 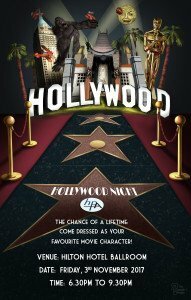 Remember to dress up to our Hollywood Theme on that special night. Come early for our instant photo booth session that starts at 6:30 pm. Seats are now limited to a few more tables. Don’t wait – Book your seats now! <Click Here> to do your booking. Make a date with us at the Hilton Hotel Ballroom on 3rd November 2017, Friday, 6.30 to 9.30 pm.